So now that you found the perfect cupcake recipe combination, you are ready to host a baby shower, birthday party, or perhaps a bridal shower. You can make your cupcake creations shine on a cupcake stand. You could even get creative with your bridal shower cupcakes by making this cupcake stand look like a wedding cake by topping the top cupcake with a bride and groom! Purchase this Good Cook Cupcake Stackerstand here. 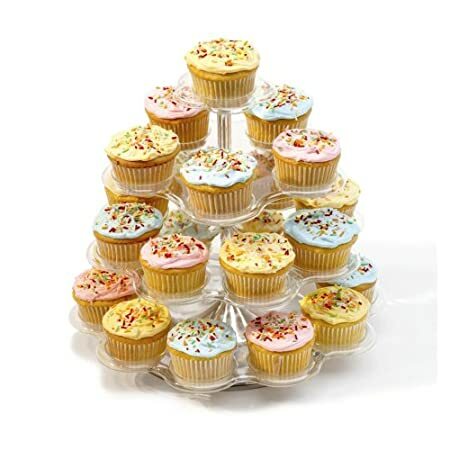 This tiered Good Cook Cupcake StandStacker makes a dazzling display at every party by holding up to 24 cupcakes muffins or other small confections. The stand is easy to clean and collapsible for storage. Perfect for any celebration.